Is Your Business ‘Ready For Sale’? At some point every business owner exits their business! Will YOU exit with equity and have your biggest pay-day ever? Do you have a ‘business ready for sale’ checklist for your business? Don’t wait until you are forced to sell by circumstances and only get a low return for all the blood, sweat, tears and time you have invested in the business? Or worse still, close the business down. The simple truth is that if you haven’t got all your ducks lined up in your business before you put it on the market then you are likely to be very disappointed with the outcome when trying to sell your business. And I say ‘trying’ because in the current business sales market you have to have all your ducks lined up to sell a business. Buyers are buying businesses but they are doing much greater due diligence than they did years ago. There are a lot more businesses for sale than there are buyers. This means that buyers can be much more selective about the business they buy. If you want your business to stand out, sell quickly and get the maximum sell price, then make sure that everything is very well prepared and ‘ready for sale’ BEFORE going to the market. business that’s ‘ready for sale’ is well worth keeping. Build your business as if you are going to keep it forever, but could sell it tomorrow. Other – the business needs to be assessed through the eyes of a buyer…..
Learning from the many mistakes I see business owners make in my role as a business broker puts me in a great position to help other business owners to prepare their business ‘ready for sale’ and avoid the same mistakes. My 10 years running my training and development business has prepared me to deliver that learning to business owners. Please check out my services on this website and contact me if I can be of help. Once again, to learn about ‘getting your ducks line up’ – click the button to get details of my next half day workshop! If everyone in the workplace / family / social group applied this filter before they spoke, what do you think would happen? Ponder on this story and think about if you should apply it in your business and / or life! Are you strong enough to do it? Is it worth doing? What difference would it make to anything? As much as we would like to sometimes, we just cannot change history. Although, some business owners still try to turn the clock back! A business, like shares, is much more attractive when there is a history of the numbers going up! The most important numbers are ‘adjusted net profit’ to the owner, turnover, and gross profit. The longer they have been going up the better but at least over the last three years. Steady growth is preferred by most buyers not sudden increases or decreases. Consistency is very important and spread over a good diverse mix of clients. It can take years to get to this state. One bad year can make a big difference in the value of a business and can put buyers off – big time! Many businesses I get to look at simply do not have a well constructed “sales process” for their business. This is absolutely critical to keeping the numbers going UP and maintaining consistency over time. For help with developing and installing a well crafted sales process in your business, consider one of my seminars CLICK HERE FOR MORE DETAILS. This is why every business owner who has any ambition at all to sell their business one day, and cash out with a good sale, needs to be planning and preparing their business ready for sale EVERY DAY. A business that is ready for sale will be much easier to manage, run without the owner, be much more successful and will attract buyers. This is the situation you want to be in so that you can have options to sell for the price you want, when you want to. You should be in control of the whole process. There are many more areas that need to be considered in addition to the numbers. For example how well you structure and record the numbers is also critical. Make it easy for a buyer (and yourself) to see what is happening in the business. Keep your eye on the ball all the time. I Like This Business Idea! That’s what went through my mind when I saw a business recently during a trip to London. Automated bike hire! When you look at it as a business it ticks a lot of boxes. One of the biggest ticks for me is the fact that it runs without the business owner having to be there! It’s all done by some simple mechanics and machines to process credit card payments. People just serve themselves! the top two reasons why business owners stay stuck in their business, and why it makes the business difficult to sell! One of my consulting clients is making great progress in these areas and it’s great to see the staff taking up the challenge of the extra responsibilities. Often, as business owners we underestimate the abilities of our staff and their desire for my ‘meaningful work’! As they take on more work and responsibility it frees up the owner to work ON the business and less IN the business. All of which helps to grow the business, making it more valuable, and makes it more attractive to buyers. Think! What would a new owner have to be able to do and be prepared to do, to replace you in the business? How easy or difficult would it be to find buyers like that? Want help with systems or delegating? Contact me! When I am asked to help a buyer who is looking at buying a business, the meeting is usually me asking a long series of questions. Many of the questions end up being questions which the buyer should be asking the seller in relation to the business and their reason for selling. At the end of the meeting with the buyer, they will often say “Thank you, now I know what I need to know and what questions I should ask”. Then I sit and wonder why they hadn’t thought of these seemingly obvious questions before. But of course, if you haven’t been through the process of buying a business before – then you don’t necessarily know what you need to know! It’s all about asking the right questions to get the right information to be able to make the right decision FOR YOU! The trick is knowing what information you need! (2) Financial aspects of the business. The seller should be able to provide you with ‘year to date’ figures and finalised accounts to the end of the last financial year. If they can’t why not? (3) How much should I spend on a business? It’s not just about price but also working capital etc. (4) Non financial aspects of the business. Just a few of the things are lease arrangements, staffing, systems, barriers to entry, seller hand over period, seller not competing… and many more,. (5) Questions to ask yourself. Why do I want to own a business and why this one? Just for starters. If you are thinking of buying a business then plan and prepare before you even start looking. Buying a business is a major decision for most people. Unlike buying a home, where if you end up not liking it you can always sell it again and get something for your money. If you buy a business and it all goes pear shaped, you could end up with nothing to sell and lose everything – including your home! Don’t take the chance! Seek good advice before proceeding – CLICK HERE. Having said all that, if you buy the right business for you and for all the right reasons it could be the best investment you ever made! Upcoming Events – This is where I recommend upcoming events which I believe are well worth attending if you are in business or thinking of getting in to business. They may be my events or events by people I know and trust to do an excellent job. My Monthly Business Owner Mentoring Groups – ongoing – CLICK HERE for details. June 7th – “Buying and Selling Businesses” at the Small Business Centre – Stirling. Half a day and I am the presenter. May 5th – Mal Emery’s “From Frustration To Freedom” workshop – Your Choice between Financial Freedom or Slavery in the Chaotic New Economy”. Hands on 1 day workshop . Mal will make this FREE for you as you are my special guest. That saves you $297 (single) or $594 (double). May 23rd – Sue Papadoulis, who is an expert in gaining free publicity for your business, is speaking on “Publicity For Profit” at the Wanneroo Business Association breakfast meeting. Sue has addressed my mentoring groups on two occasions and is terrific value! It’s Great To Have Standards In Business! It’s great when you spot a business which “sets high standards” and pays attention to detail. 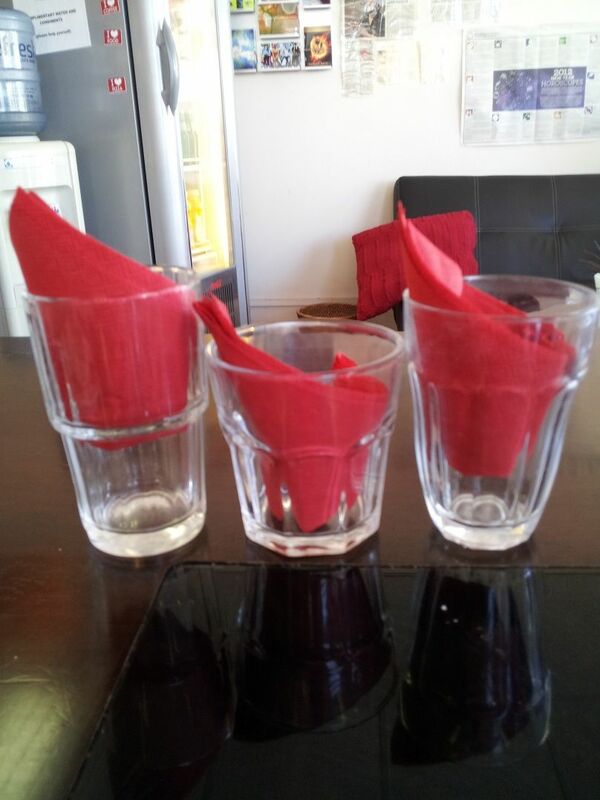 Here is a small and not serious sign of a business which doesn’t pay attention to detail or train staff to maintain standards.This table was set for three people! We all had a choice of style of glass we wanted to drink from! This quite funny example occurred in a very good cafe in our local shopping centre. It was funny rather than serious but reminded me of how a lack of attention to detail can detract from an otherwise good business. How well do you set standards in your business AND train staff to maintain them? When it comes to selling a business it makes the decision for the buyer much easier if there are good systems and standards in place.cIt makes the buyer feel confident that the business can continue to be a success under the new owner. If you would like help with this or any other aspect of getting a business in to a ‘ready for sale’ state – please contact me via the CONTACT US tab at the top of this web site! All the best, John Denton – helping prepare business ‘ready for sale’ because a business that is ‘ready for sale’ is well worth keeping! Ask Mark Harvey, the Australian Rules Football coach of the Fremantle Dockers – he was at a public function representing the club in the morning and sacked at 4.00 pm in the afternoon! Or ask the board of the St Kilda football club who were told by their coach, Ross Lyon, that he was quitting and not seeing his contract through to the end of the 2012 season. Mark Harvey also had 12 months of contract to go. So who do we TRUST? Not politicians, not religious leaders and not footy clubs and coaches – it seems! Apparently, according to reports in various media, we are more and more trusting people we know and love. People who are close to us. More business is done by referral and trusting what our friends say than by traditional advertising in the media. Power has shifted to the ‘client’. It is a buyers market in almost every category out there. Certainly in retail it is where more and more people are doing their research online before approaching a retail outlet. In some cases people are using their smart phones (iPhones and their equivalent) to scan bar codes in stores and find out the online prices for products and then approaching the checkouts and demanding they match the price. A retailer has told me this happens in his stores!. So how do you get people to TRUST you? How do you get them to come to you in the first place and try you out? Well you can try the traditional method by offering large discounts! Hence the sudden rise of discount vouchers like Scoopon, Cudo, Groupon etc. This can be a good way to get people in for the first time (but make sure you do your maths first – or you will go broke!). You then have one chance to impress them enough so that they keep coming back! How many business owners know how to entice a customer back? How many business owners know how to develop a client for life – based upon TRUST? Not many! One very effective way which businesses and major corporations alike are trying to “get referrals and build trust” is through the massive popularity of social media marketing – and Facebook and Twitter particularly. On the Gruen Factor program recently they talked about how KLM, the Royal Dutch Airline, were monitoring Twitter in Schiphol (Amsterdam) airport. When they saw someone tweet who was booked on a KLM flight, staff would go and find them and give them a gift to thank them for flying KLM. What do you think this avid “tweeter” did after getting the gift? YES, they tweeted about the gift and how great KLM were! Instantly getting the word out to goodness knows how many of the person’s friends AND everyone else on twitter about how great KLM were. Beautiful, wonderful, FREE word of mouth marketing (apart from the small cost of the gift). So, how are you using the new (FREE) social media marketing tools to develop trust and seek referrals for your business? There are many small and medium businesses, as well as the major corporates, who are taking advantage of things like Facebook. Go explore the possibilities! It’s largely free marketing apart from your time. All the best for you in your business. I am a business coach and business broker. I work with business owners to help them build their businesses and prepare them ‘ready for sale’. I do this through business owner mentoring groups, one on one coaching and a variety of workshops and seminars. “Party Plus engaged John Denton to present and facilitate an all-day workshop for franchisees (business owners) on 25 July 2010. The day included presentations and activities on the business sale process, with an emphasis upon achieving maximum sale price and minimum timeframe through a process of conscious business planning and improvement. John received a consistently high rating and positive comments from the franchisees. As the event organiser, I appreciated John’s willingness to determine our brief for the day, to relate his presentation to prior learning events we had conducted, and to deliver as per our expectation. I found John reliable to work with, he delivered what was agreed in full, exercised good time management , and was flexible on the day to spend more or less time in areas the attendees wanted. Party Plus franchisees operate a 6 day business, so to ask them to devote a Sunday off to a workshop and pay for it takes a leap of faith. John delivered and the franchisees stated they gained real value from their investment. For more on my workshops and facilitations go to the “Workshops” tab at the top of this page! And They Wonder Why They Have Problems …. I can’t believe it is so long since my last article. Things have really taken off since the new financial year started (1st July for the non Aussie readers) in that we are now finally getting genuine business buyers in the market place who are prepared to make realistic and acceptable offers. This is resulting in deals being done and businesses changing hands! Yeah! We say. But it doesn’t come without some frustrations. One of the most common frustrations is people’s lack of “attention to detail”. In Australia we are famous for the “She’ll be right, mate!” attitude. Unfortunately, when it come to legal contracts and the exchange of large sums of money if “She ain’t quite right mate!” then it can end up costing someone a lot of money, time and stress. And none of us need any more of that. An example is the legal entity of the seller’s business and the buyer’s business. It’s one of the first questions I ask people. And they tell me it is, e.g. XYZ Pty Ltd. It gets put on to the paperwork and the owner signs the Authority To Act, for example. In spite of repeated questions it turns out later, at a critical time, that there are multiple directors and some don’t want to sell. Or, there is a “trust” involved and the Pty Ltd is a trustee for the trust.This can cause all kinds of complications down the track. Of course it matters!!! And then settlement of the deal gets delayed and people get angry and frustrated and start looking for people to blame. No matter how much as brokers we strive to get the correct information and detail, we are usually at the mercy of the owner’s memory (apart from certain things which can be searched on government databases) – which has often faded with time! TIP: Always check what you are writing on forms BEFORE you fill it in. And the old adage “NEVER ASSUME” – please! P.S. Check out my upcoming workshops in Perth – next one is October 23rd – go to Workshops tab for info.